Have never tasted anything quite like it. Only problem is, we cannot get them in Sweden. So now I have a problem! How will you fix this, Whittakers? This chocolate is unique but totally satisfying, it has a soft lemony taste mixed with white chocolate and fizzy pieces, even though this sounds overwhelming its actually the perfect combination and will leave you wanting more! 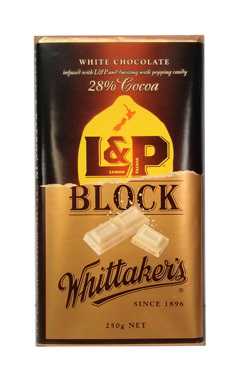 We all love Whittakers white chocolate, and we all love L&P. This chocolate is the most magical mixture of the two, I have to buy a block every couple of months from SANZA to fend off the cravings. I highly recommend this chocolate! It just taste so real! I ordered the big block because I know my boyfrien LOVES White choco and L&P, the block is really big and oh so yummy! you really taste the L&P and the poppin candy make it so much nicer! this chocolate is so smooth and I would recomend it to lots of people!